The Connecticut Department of Transportation presented a $10,000 check to New Haven Promise Tuesday at New Haven City Hall. That amount was awarded to CTDOT for winning the 2016 America’s Transportation Awards Grand Prize for the Elm City’s Pearl Harbor Memorial Bridge, the first extradosed bridge to be constructed in the United States. In November 2016, CTDOT was recognized by the American Association of State Highway and Transportation Officials (AASHTO), AAA and the U.S. Chamber of Commerce as the 2016 America’s Transportation Awards Grand Prize winner. With the prestigious award came a $10,000 cash prize to be donated to a charity of the agency’s choice. CTDOT selected New Haven Promise as the recipient for its commitment to providing local New Haven students with scholarships to further their education in Connecticut. The organization’s mission is to improve city schools and encourage economic development in New Haven by growing a competitive workforce. Promise President Patricia Melton accepted the $10,000 donation on behalf of New Haven Promise while New Haven Mayor Toni N. Harp and CTDOT Commissioner James P. Redeker added remarks. After nearly two decades, more than 30 construction contracts and the creation of hundreds of jobs, the I-95 New Haven Harbor Crossing Corridor Improvement Program will be completing the final elements of the I-95/I- 91/Route 34 Interchange and construction of the new Boathouse at Canal Dock through Fall 2017. The centerpiece of the program — the new Pearl Harbor Memorial Bridge — replaced one of the largest bottlenecks in the Northeast and now stands tall in the New Haven Harbor as a reminder of the importance of rebuilding the state’s infrastructure and creating job opportunities. 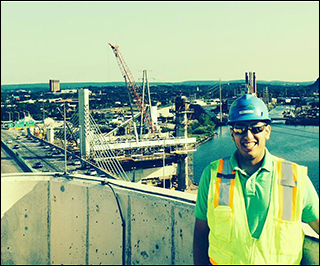 This entry was posted in Staff Notes and tagged Connecticut Department of Education, James Redeker, Jordy Padilla, Pearl Harbor Memorial Bridge, Q Bridge by New Haven Promise. Bookmark the permalink.